This week, our battles shift into high gear with our first lightning round. Final Four voting will close Thursday afternoon, so get your votes in quick! And don’t forget that over the weekend, you’ll be determining our ultimate Chompion. It’s anyone’s game, really, now that we’re down to the cream of the crop, and we have two matches to call. It’s so close to summer that Ben and Jerry’s is certainly coming in with, well, frozenness in its favor. Even if it’s not hot, the air is starting to smell like summer vacation, and where’s there’s summer, there’s ice cream. While I’d love to say “scoop some ice cream onto the brownie” and call it a win for both, the world just doesn’t work that way. Sorry, brownies—ice cream is going to win this one. 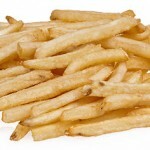 Fries have been showing up consistently, week after week, as one of the highest-tallying foods. Are Reese’s Cups amazing? Yes. But this just isn’t their week. I hold fast to the prediction that Fries are going to take all this year. Frankly, let’s dip the fries in the ice cream, put the ice cream on the brownies, and crumble the Reese’s on top. Now that’s a Super Bowl Sundae! Is your stomach rumbling yet? Be sure to vote for our championship game teams online or at the circulation desk in Falvey. Follow us on Facebook and Twitter for more #nomnomnomatology action.